Peptide mass fingerprinting (PMF), ,, can identify mammalian sources of collagen-based materials such as bookbindings, leather, and parchment. The technique uses enzymatic digestion of extracted collagen to cut the protein at specific amino acid sites forming a mixture of peptides. Each mammal has a unique amino acid sequence for its collagen, thus the mixture of peptides is unique−a “peptide mass fingerprint.” We use Matrix Assisted Laser Desorption / Ionization Time of Flight Mass Spectrometry (MALDI) to analyze the peptide mixture, and the resulting mass spectrum contains species-specific marker ions, which are compared with those from known materials to determine the species from which they were derived. The table of marker ions  allows us to distinguish among a large number of mammalian species, including human. The PMF examples below show how markers are used to analyze the MALDI mass spectrum and identify the source of the material. Figure 1. Examples of PMF’s from human (upper) and sheep (lower) collagen. Figure 2. An illustration of the size of sample needed for successful PMF analysis. Figure 2 above illustrates the size of samples needed for successful PMF analysis. The method is extremely sensitive so very little sample is required. 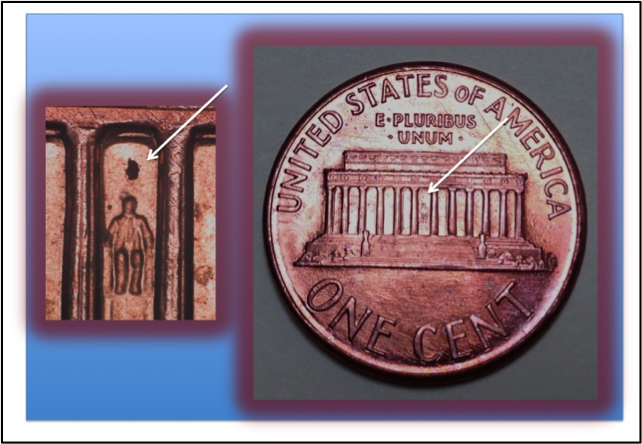 As a rule of thumb, if the sample is visible under 30X magnification there is sufficient material for analysis. Larger samples do not interfere with the analysis, and they can be sub-sampled, if necessary, and the excess put aside. We are working on new sampling methods that will be practically non-invasive to the object being analyzed, and we can supply detailed instructions for obtaining samples correctly. Currently PMF analysis can identify many mammalian sources to the family level and, in some cases, to the species level. This level of specificity might seem limiting, but it actually lends itself better to the analysis of books bound in human skin than more specific methods, like DNA analysis. With PMF one can very quickly rule out the usual materials used for book binding, because markers for humans are easily distinguishable from sheep, goat, pig, cow, and deer (as shown above). When the result is a match for the Hominidae family (also known as the great apes) the material is very likely of human origin, as it would be very unusual for books from America and Europe in the 19th century to be bound in the skin of another member of the great ape family–especially if the book had a story attached to it of its human origin, which both the real and fake ones often do. Analyzing the proteins to determine what animal family an object comes from has another benefit — unlike DNA, proteins like collagen, which makes up human and animal skin, last far longer in an old object than DNA will. Collagen can outlast most other kinds of materials, as long as the skin itself is preserved through a method like tanning or mummification. Also, DNA’s sensitivity can lead to false positives, where DNA from a human handling a book might get magnified and lead the results to say the book itself is of human origin when it is not. Follicle pattern recognition is another method often employed to test alleged anthropodermic books. The premise of this test is that human follicle patterns on skin are arranged in different shapes than other animals. However this test can be rather subjective, as one woman’s triangle pattern might be another’s diamond, and processes of tanning and stretching leather can distort natural patterns. The sensitivity and specificity of DNA analysis still has advantages over mass peptide fingerprinting for certain uses. For instance, if smugglers are caught with ivory, PMF can be used to determine whether it is really from an elephant, but only DNA can distinguish an African elephant from its Indian cousin of a less protected status. How this comes into play for human skin books is that while the testing can determine that it is of human family origin, for the books whose provenance might be problematic, we cannot tell whether the skin came from a man or woman, where that person might have come from, or who their relatives might have been. Kirby, D. P., N. Khandekar, J. Arslanoglu and K. Sutherland, “Protein Identification in Artworks by Peptide Mass Fingerprinting,” Preprints, ICOM-CC 16th Triennial Conference, Lisbon, Portugal, (September, 2011). Kirby, D., M. Buckley, E. Promise, S. Trauger and T. R. Holdcraft 2013, “Identification of collagen-based materials in cultural heritage,” Analyst (138) 4849-4858. Promise, E., T. Rose Holdcraft, D. Kirby, and S. Haakanson, “Identifying collagen-based materials: A cross-cultural collaboration,” Preprints, ICOM-CC 17th Triennial Conference, Melbourne, Australia (September, 2014). Henzel, W. J., C. Watanabe and J. T. Stults 2003. “Protein identification: the origins of peptide mass fingerprinting,” J. Am. Soc. Mass Spectrom. (14) 931-942. M. Buckley and M. J. Collins, Antiqua, 2011, (1) 1-7. Header photo of lab equipment by Megan Rosenbloom.